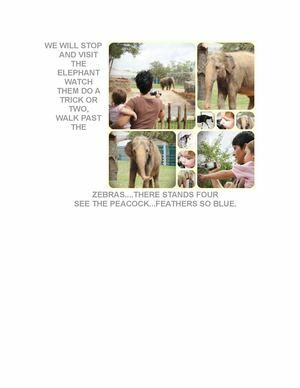 WE WILL STOP AND VISIT THE ELEPHANT WATCH THEM DO A TRICK OR TWO, WALK PAST THE ZEBRAS. . . . THERE STANDS FOUR SEE THE PEACOCK. . . FEATHERS SO BLUE.